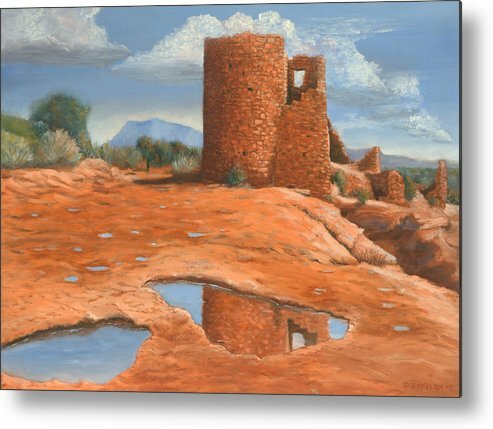 Hovenweep Reflection by Jerry McElroy - 10.000" x 7.375"
Hovenweep Reflection metal print by Jerry McElroy. Bring your artwork to life with the stylish lines and added depth of a metal print. Your image gets printed directly onto a sheet of 1/16" thick aluminum. The aluminum sheet is offset from the wall by a 3/4" thick wooden frame which is attached to the back. The high gloss of the aluminum sheet complements the rich colors of any image to produce stunning results. Jerry, this is wonderful! I painted a painting of a raven that perched on this very building....I know exactly where it is. What a magical place. I love the reflections in the water. Jerry, This is really nice! An absolutely gorgeous painting of this beautiful site, Jerry! 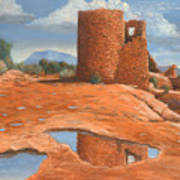 I love the soft earth tones and the water catches, but the Remnants of the "tower" is just superbly done! The background of the beautiful sky and clouds, just makes this a true masterpiece of art work! Congrats on your sale, as is is so well deserved, and hopefully will inspire more sales of such great pieces! Reflected in the puddles after a rain, the castle at Hovenweep National Monument. 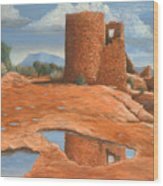 If you are interested in buying the original painting, go to my website at jerrymcelroy.com. Thank you!